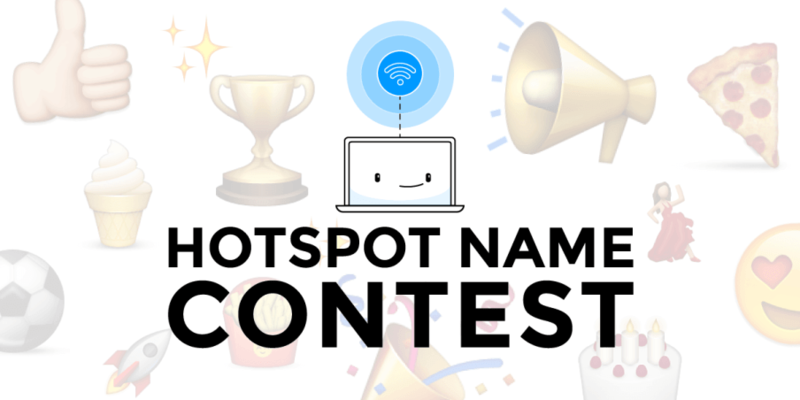 Blog CONTEST: Share Your #coolhotspotname and Win! CONTEST: Share Your #coolhotspotname and Win! Connectify Hotspot is the only virtual router software that can successfully create a mobile hotspot on any PC running Windows 7 or newer. The new Connectify Hotspot 2019 has just been released. Along with more efficiency and compatibility, we also added new emojis. You can use those to personalize your Wi-Fi mobile hotspot name. Let’s celebrate the launch! We’re giving away 19 Connectify Hotspot MAX Lifetime licenses. If you’re not using it already, download and install Connectify Hotspot 2019 on a Windows PC – it’s FREE! Give your Wi-Fi hotspot your favorite name and include emojis and special unicode characters to make your hotspot name stand out. Share your Wi-Fi hotspot name with us on Twitter or Facebook. Include a screenshot of the name or simply paste it. In order to be eligible, add the #coolhotspotname hastag to your submission. You should also mention “@connectify” on Twitter and tag “Connectify” on Facebook. The contest is open to everyone until end of day on March 1st, 2019 February 17th, 2019. Feel free to submit as many hotspot names as you want! We’ll make our picks and notify the lucky winners on Monday, March 4th, 2019 Tuesday, February 19th, 2019.